At the corner of Flinders Street and Exhibition Street is a small halal Chinese restaurant that opens all seven days a week, available for dining in, takeaways and catering. My family and I wanted to try it for dinner on the Monday we arrived in Melbourne, but they're closed on Monday nights, so we went for dinner the next day instead. Mama Wong's Kitchen is also closed on public holidays. It's not the best place when it comes to aesthetics; a tiled floor and plain walls, with large glass windows overlooking the traffic junction outside. There's not a lot of space here, but I noticed that most customers came in for takeaways. Besides my family, there were only two other groups of people dining, though the restaurant felt far from empty. For appetizers, we got the handmade vegetarian spring rolls - for a starter, it only arrived after two of our main dishes. They were quite nice, though nothing spectacular. My sister ordered the mee goreng - stir-fried hokkien noodles with vegetables and meat. It came with a slice of lemon, which is a bit unusual, as it is more typically served with lime instead. Nevertheless, it was a good, filling dish and my sister cleared her plate of it (with a little help from the rest of us). 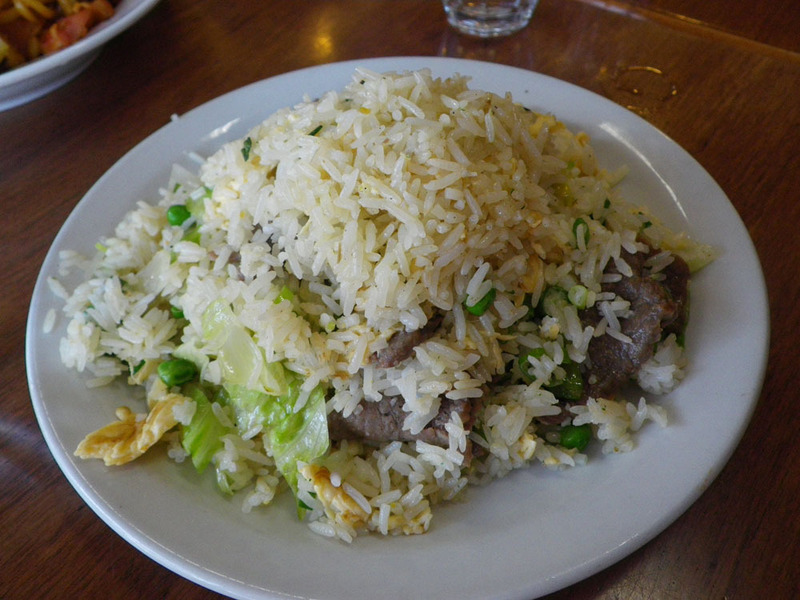 For almost every Asian restaurant I visit, the fried rice dish to me is a mark of how good the food there actually is. 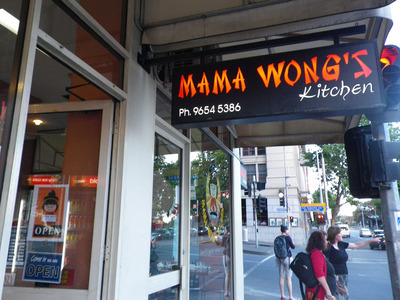 I'll say that Mama Wong's fried rice is just satisfying in taste; like the spring rolls, nothing fantastic. My brother who ordered it found it a little lacking in taste and ate the most of it with some soy sauce. It's not a very decorative dish, just rice stir-fried with vegetables, beef and eggs. One of the best dishes we ordered was the beef and seasonable vegetables stir-fry in oyster sauce. 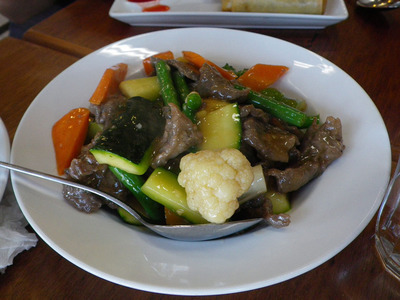 The beef was soft and tender, and the oyster sauce went well with the combination of meat and vegetables. I would have preferred it with a leafy vegetable instead of cucumbers though. We had this dish with a serving of steamed rice. The last dish to arrive at our table was the king prawn omelette, a delicious combination of king prawns and savoury gravy wrapped in a fluffy omelette. This was my favourite of all the food we ordered. I was very pleased with the flavour, though some of my siblings complained that it was a bit tasteless. This is coming from a group of people who are accustomed to very strong tastes and flavours in our meals. 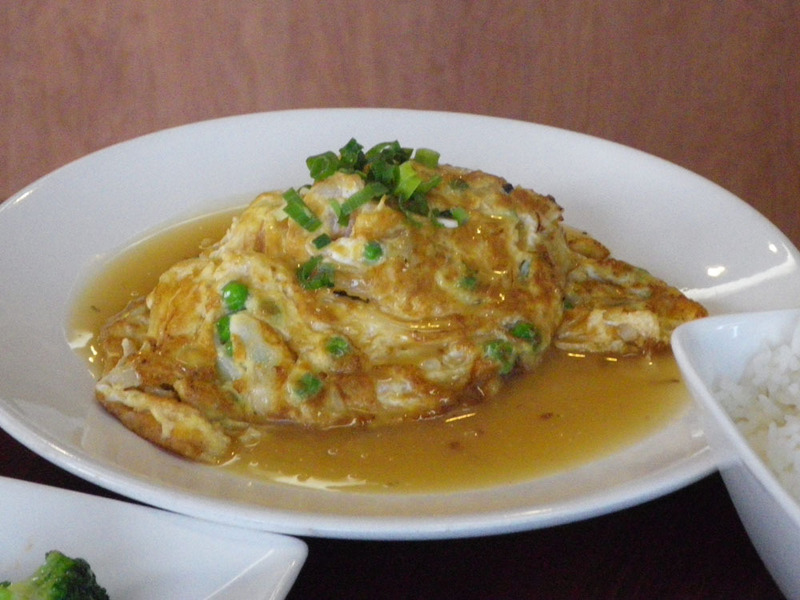 Whatever it is, it's nothing a little bit of soy sauce can't cure. Overall, the food was reasonably tasty for the price we paid; the service could be better though. Our server was a bit curt with us, and never offered a smile. One other disappointment was how a lot of the dishes on the menu that we wanted to order were finished, so we had to go with alternatives instead. It wasn't just one or two dishes, but four of them altogether; it was a bit surprising, as we were there at about 6 or 7 in the evening, when the restaurant would have opened for dinner at 5.30pm. Why? Halal Chinese food for dine-in or takeaways. When: Monday from 11am-3pm, Tuesday to Friday from 11am-3pm and 5.30pm-9pm, weekends from 1pm-9pm. Cost: Main dishes range from $8.50 to $16.50.